With the increase of flights across the country, driven in part by the needs of e-commerce but also responding to larger passenger traffic demands, airports are continuing to be a critical component of economic development. Looking for an economic step up for their respective areas Airports are expanding their offerings, adding not only maintenance repair services but in many cases more passenger handling abilities. Mark Canty, the director of trade and business development for the Aerospace Park at the Tri-Cities Airport in Blountville, Tennessee, says that they currently have 31 acres ready for immediate construction after recent land grading efforts. “We are ready for building up now as soon as we get a prospect here ready to pull the trigger on that,” Canty says. The park will continue to grow, he says, with the goal of handling all sized aircraft in the future, from 747s to the Airbus 380, which is currently the world’s largest passenger aircraft and about twice the size of a 747. Stuart Hair, the director of economic and community affairs for the aviation department at the city of Charlotte, North Carolina, says they have a developed a multi-pronged program to develop the aircraft site at the Charlotte Douglas International Airport, which is the sixth busiest airport in the country offering more than 160 nonstop destinations around the globe. One of the prongs is focused on the expansion of one of the five concourses, Concourse A, which opened in July. 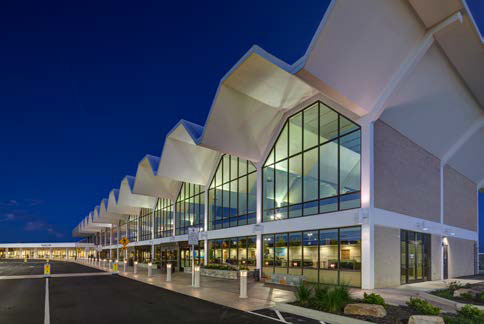 That was a nine gate, 230,000 square foot addition, representing the first project completed on the $2.5 billion capital program, Destination CLT (CLT is the FAA designation for the Charlotte Douglas International Airport). He says that there was a real desire to grow flights for not only American Airlines, the airport’s main hub carrier, but also for other non-hub carriers. Those other carriers include United, Southwest, Jet Blue, Frontier and Air Canada – all went into the Concourse A expansion. They have two main districts that they are working on: one is a destination district on the north side, where Amazon is constructing a 2.4 million square foot distribution facility on a 90 acre site in that area, bringing 1,500 jobs there in the summer of 2019. The other is the River District on the west side, a mixed-use development community. 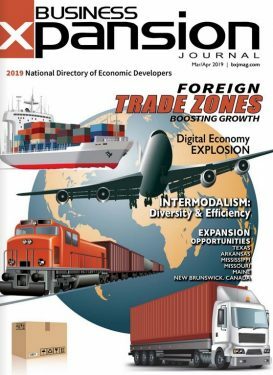 “We really hope to be a hub of economy activity beyond just the direct aeronautical activity, with warehousing, manufacturing, logistics, business offices and greater passenger amenities,” Hair says. Poised between the Arizona/Mexico border and Interstate Highway 10, the Sierra Vista Municipal Airport (FHU) is a strategic location for business growth, offering multiple runways, a large terminal, expansive parking, and buildable acreage for light, airport-related industry. The facility is home to three runways— one at 12,001 feet in length—offering aviation amenities generally found at heavily trafficked airports in congested communities. Sierra Vista Municipal Airport, far enough from the beaten path that it experiences light private use but located in a strategic corner of Southeastern Arizona, is a hidden gem. Operating under IATA airport code FHU, the Sierra Vista Municipal Airport is one of only 22 joint-use facilities in the nation, sharing runway use and tower operations with adjacent U.S. Army’s Fort Huachuca and Libby Army Airfield. In addition to impressive runways, FHU boasts a 7,000 square foot terminal, more than 250 parking spaces, and over 13 acres for industrial expansion, along with aviation fuel services, hangars, and tie-down sites. Sierra Vista is also home to a tech-savvy workforce and aviation and cyber education opportunities. With five higher education institutions, including one of the first nationally recognized Cyber Operations programs and one of the top ranked community colleges in the country, Sierra Vista offers a highly skilled, tech-savvy, educated workforce. University of Arizona Sierra Vista boasts one of the nation’s top Cyber Operations programs. The National Security Agency recently designated U of A’s Cyber Operations program as a Center of Academic Excellence in Cyber Operations—a designation shared by only 20 cyber programs in the nation. Students emerge from the program with the knowledge, skills, and abilities to operate in the challenging environment of cyber space. 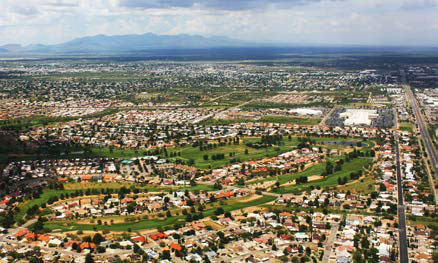 With a 360-degree mountain view, Sierra Vista residents enjoy an affordable, and extraordinary, quality of life. With 43,000 residents, this right-sized community serves a regional population of more than 100,000, creating a big-city feel without the downside of metropolitan areas. Residents enjoy four seasons, a temperate year ‘round climate, and easy access to mountain trails. For more information: SierraVistaAZBusiness.com. The Phoenix-Mesa Gateway Airport Authority (“PMGAA”) Board of Directors has approved two land leases that will result in the first new privately-funded hangar developments in nearly a decade. Aviation Performance Solutions, LLC (“APS”) and Wetta Ventures, LLC each have plans to develop aircraft hangar facilities on PMGAA-owned property. At the center of the City is the OnThe City of Lebanon and the Lebanon Municipal Airport are growing rapidly, with logistical advantages driving that growth. The city’s forward vision and expanding infrastructure attracts people from all over the world yet proudly encompasses southern hospitality, remaining affordable and primed for growth. In the past five years, LMA has more than quadrupled operations with growth to over 28,000 operations in 2018. LMA has a highly focused and service-oriented team with Direct Flight Solutions providing the flight services. DFS is solely owned by Heather Bay with highly skilled, focused employees. Aviation services include aircraft maintenance, flight training, affordable fuel, hangar storage or overnight tie down space, LMA ensures a safe and secure airport. Direct Flight Solutions goal is to exceed the needs of our growing aviation transportation network. Along with DFS, there are three flight schools and the office of Wilson County’s Joint Economic Community Development Board. With two runways, a 5000 sf asphalt runway with a GPS instrument approach and an 1801 sf rare grass runway, we are experiencing unprecedented growth. A multi-million-dollar project on the West side catering to corporate jets and clients, the East ramp hosts historic aircraft and boasts an active aviation community. With active organizations, several Fortune 500 airfield tenants and over 90% of the top employers in Wilson County utilizing the airfield, LMA actively shares aviation with the entire community. With two runways, a 5000 sf asphalt runway with a GPS instrument approach and an 1801 sf rare grass runway, we are experiencing unprecedented growth. A multimillion-dollar project on the West side catering to corporate jets and clients, the East ramp hosts historic aircraft and boasts an active aviation community. With active organizations, several Fortune 500 airfield tenants and over 90% of the top employers in Wilson County utilizing the airfield, LMA actively shares aviation with the entire community.